This is part of a report on 2009 Walla Walla Fall Release Weekend. Download a complete .pdf copy of the report here. Writing about Gramercy Cellars recently I said “If you are looking for a bandwagon on which to jump, now would be the time.” Less than a year later, I must amend that statement. The concept was right but the metaphor all wrong. This was not a passing bandwagon but rather a rocket ship on the launch pad. After a string of exceptional reviews from Wine Advocate, I can report that Gramercy Cellars has now achieved lift off. In five short years, Gramercy Cellars has established itself as one of the top wineries in Washington State. What distinguishes this winery from others? Like many, they are making exceptional wines. However, these wines are unique from their peers stylistically and structurally with higher acid, lower alcohol, and less oak influence. The wines are both varietally correct and explore new facets of the varieties in Washington. Sum all of this together and you have a winery well separated from its peers. However, when you add the compelling expression of the ever elusive, much discussed and debated terroir, Gramercy has left the earth’s gravitational pull and is on its own unique trajectory to success. Where they will go, nobody knows. Gramercy Cellars produces approximately 3,500 cases annually. 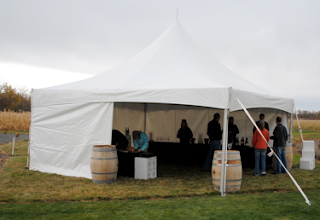 For Fall Release, Gramercy was pouring out of a tent set up next to their estate vineyard adjacent to Waters Winery. All wines sampled at 58 degrees. NB: See a hilarious video made by Gramercy on starting the winery here. Rating: ** (Exceptional)Violets, game, and earth mark the nose on this wine. Beautifully textured across the palate with exceptionally pure fruit along with earth flavors. 100% Syrah. Les Collines and Forgotten Hills vineyards. Aged in French oak (10% new) for fifteen months. 13.9% alcohol. 389 cases produced. Rating: * (Excellent) Dark in color. Nose marked by abundant game notes along with violets. A velvety texture with an extended finish. 97% Syrah, 3% Viognier. Forgotten Hills and Minnick vineyards. 13.9% alcohol. 556 cases produced. Rating: * (Excellent) Redolent with black licorice, ground spices, tobacco, and pepper. Surprisingly lithe on the palate. Exceptionally well balanced with focused fruit, spices, and light oak influences along with a touch of chocolate and herbal flavors. 100% Cabernet Sauvignon. Pepper Bridge and Phinny Hill vineyards. 13.9% alcohol. 375 cases produced. Rating: ** (Exceptional) An intensely aromatic wine with pepper and strong black licorice aromas. Wow! A powerhouse on the taste with richly textured fruit and light herbal streaks. A healthy dose of acidity tops it off. 80% Grenache, 20% Syrah. 13.9% alcohol. 189 cases produced. Rating: ** (Exceptional) An aromatic powerhouse with violets, game, and chocolate aromas. Boasts a fullness on the palate, especially the mid-palate, that is simply breathtaking. The purity of the fruit and the balance of this wine are beyond exceptional. 100% Syrah. Les Collines and Forgotten Hills vineyards. Aged in French oak (approximately 15% new). 13.7% alcohol. 146 cases produced. To be released Spring 2010 (NB: This wine was released last month subsequent to the publication of this report). Rating: ** (Exceptional) A downright stinky, intense nose with lots of earth aromas. Richly textured with fruit on the palate. 75% Tempranillo, 15% Grenache, and 10% Syrah. 13.9% alcohol. 330 cases produced. Rating: ** (Exceptional) An alluring nose with pencil lead, Red Vines, licorice, baking chocolate, and spice. Beautifully integrated and balanced with a fair amount of pencil lead flavors. A long, effortless finish. 92% Cabernet Sauvignon, 6% Merlot, and 2% Malbec. 100 cases produced. Two patterns here: (1) Greg has an amazing skill with keeping the alcohol under 14% or he doesn't want to pay more tax; and (2) his grenache and tempranillo are "cut" with bolder-flavored grapes. Looks like you (and many others) appear to favor this trend, while I think that it takes away some of the delicacy of the labeled varietal. Grenache (mild) and tempranillo (low acid) have faults but that's part of the beauty of drinking them. I love Gramercy wines.....Greg has put his passion for great wines into action....and we are the beneficiaries. Keep producing cutting edge wines, Greg....and I'll keep enjoying and buying. WAwineman, on #2, to me it all depends on what you are looking for as a wine consumer and what the winemaker is looking to accomplish. As a consumer, would you rather have a pure varietal wine or a varietally labeled wine that contains a significant percentage of blended grapes to ‘improve’ certain aspects of the wine (in the winemaker's mind obviously)? For me the answer is...both! As long as it is a well made wine. This is not unlike the discussion/debate over whether a single vineyard, single varietal wine is superior to a single/multiple AVA wine or a blended wine. Again, to me, I appreciate all of them as long as they are well made and accomplish what they set out to. That said, I agree that blended wines can at times interfere with some of the delicacies of the varieties in the blend. The question is, is this necessarily always a bad thing? The Grenache is an interesting example. This wine was blended with 20% Syrah, a grape it is often blended with as they can pair well. If it was labeled as Red Wine, how would that influence your thinking about the wine versus it being labeled Grenache? Would your expectations be different? Carol, thanks for the comment. I am no 'purist' when it comes to wines. Just feed me good wine. I agree that blending grapes can achieve results greater than the sum of the components. That's how Bourdeaux makes its living. Flip side, when a blending grape's attributes begin taking center stage (eg. syrah's "intensely aromatic wine with pepper...") over the listed varietal's primary red fruit characteristics, then, yes, I appear to have an issue with the labeling. For comparison, I go to the market and buy 2% milk. At home, I drink a glass and it tastes like whole milk. I call the store and they say, "Oh, it's 2% milk with added milk fat equivalent to whole milk." Sounds stupid? It's the same smell, imho. And, if it really happened, it wouldn't sound stupid to the victim. My other question: how much did you buy of these expensive wines? Anon, I agree it's problematic when a blending grape starts to take center stage and interfere with the varietal labeled on the wine. I was talking with someone today about how even a small percentage of something can sometimes be disruptive and topple the whole apple cart (even say 5% let alone 20%). Labeling decisions are interesting. For Bordeaux-style wines, it's a bit easier because wineries can say Red Wine/Claret/Meritage and label it on the back as a Bordeaux-style or whatever. You see this all the time for wines, even though they could be labeled Cabernet or Merlot. Makes me wonder whether this is a business decision (that is, I want to label this Red Wine/Cabernet because it will sell better) or more stylistic (I'm not going to label it Cabernet because it's different than a Cabernet due to the blending). Generally though consumers have some understanding of the terminology (or at least that Bordeaux exists and makes wine). Meritage and Claret are less understood as terms. Harder to do for the GSM blends. "Southern Rhone Style Blend" doesn't have the same type of understanding/branding with American consumers. Similarly, wineries don't generally write 'Red Wine' for these types of wines as that has a different connotation. Give it a non-variety name and no one knows what the heck it is. So are you better off labeling it Grenache even with a big dollop of Syrah? Interesting to think about. Suffice to say, I bought far more of these wines than I should have for a man who knew he was about to lose his job in several weeks. Nice blog and nice job on the WA coverage. I'm commenting here as Gramercy is now on my radar as you know. The 2007 Lagniappe I tried is a terrific wine. Their other stuff you reviewed above sounds great, too. Love the sub-14% alcohol levels. Dig your WWR. Tons of info! Dude, thanks for the comment and glad to hear you enjoy the blog. If you like Gramercy wines, definitely check out the Focus Report on the winery as well. I agree that it's nice to see a winemaker pull back the reigns on the alcohol. So many these days are 15% plus.